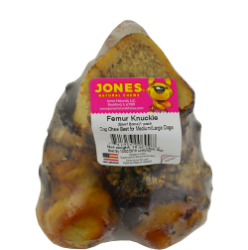 All natural Femur Knuckle is dipped in liquid smoke and oven baked. It is Jones’ largest knuckle and with no artificial ingredients, . The soft knuckle material is a delicious treat and will leave a hard bone underneath for longer chewing. The Femur Knuckle is the large end of the beef femur bone in the hind leg. All Jones’ products are 100% grown and made in America.